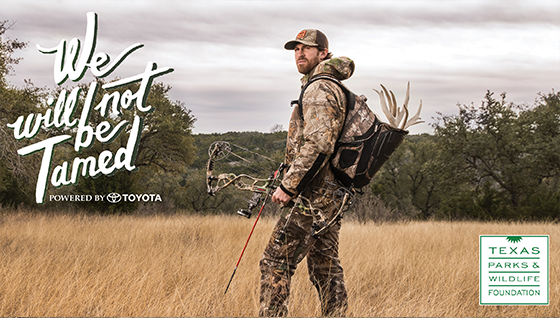 Jordan Shipley’s career has taken him from the Friday night lights to the pre-dawn light of a South Texas deer blind. A high school and later college football star, Jordan’s NFL career was cut short due to injury. Now he takes the same focus that he brought to a football field to his lifelong passion for hunting. That’s why he’s joining with Texas Parks and Wildlife Foundation (TPWF) to celebrate the remarkable work of conserving the wild things and wild places of Texas. You can read about Jordan’s story in the pages of Texas Monthly. Texas Monthly just released a new video about Jordan, too. 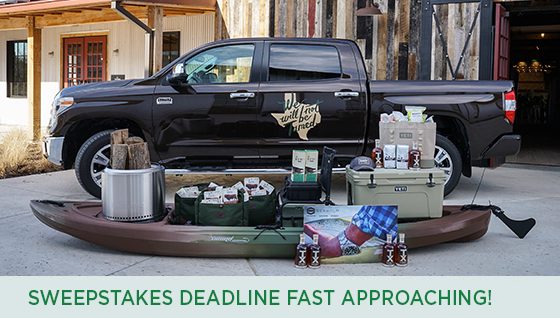 Our Trailblazing Texas partners have joined forces to offer the We Will Not Be Tamed Sweepstakes, an amazing collection of outdoor gear and goodies that will allow you to Live the Wild Life. YETI, Howler Brothers, Outdoorsy, Kammok and more are offering up their best products to the lucky winners. The grand prize is a Toyota Tundra! But hurry, the deadline to enter is just days away! Enter by October 30 to win! Outdoorsy is making it easier to check out a state park in an RV or camper. The web platform connects RV owners with customers looking for a new experience. Outdoorsy is offering a chance to win a 3-day rental in their RV Coach to anyone who joins TPWF as a member this month. 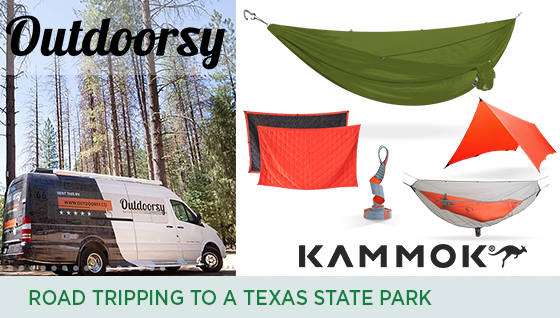 And there's more... the winner of the TPWF drawing will also win great gear from Kammok, including a Roo Double camping hammock with straps, Dragonfly insect net, Kuhli weather shelter and mountain blanket. This trailblazing company is leading the way in outdoor gear to elevate your camping experience with technical and functional hammock gear. Wouldn’t that be a great way to experience a Texas State Park? TPWF supports projects in state parks across Texas that enhance the visitor experience. From improving the bird blinds at Abilene State Park, to funding trail entrance kiosks at Colorado Bend State Park, TPWF is funding projects that will enrich your visit. You can help support TPWF’s efforts by becoming a member today. *The price of membership pays for TPWF membership only and not for the chance to win the 3-day Outdoorsy RV Coach rental and Kammok gear. Members who join by October 31 are automatically entered in the drawing. The Outdoorsy RV Coach rental is only available for dates that are not previously booked. 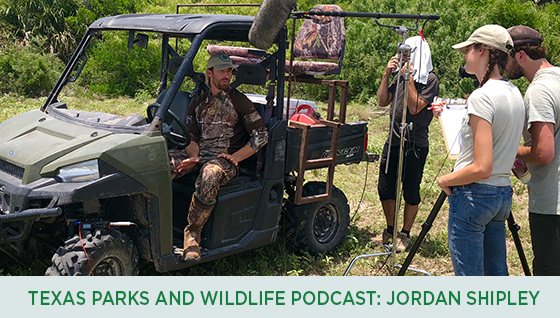 TPWF’s podcast crew tagged along on the recent Texas Monthly video shoot with Jordan Shipley in South Texas. We eavesdropped on the interview, and you can listen in on this month’s podcast. 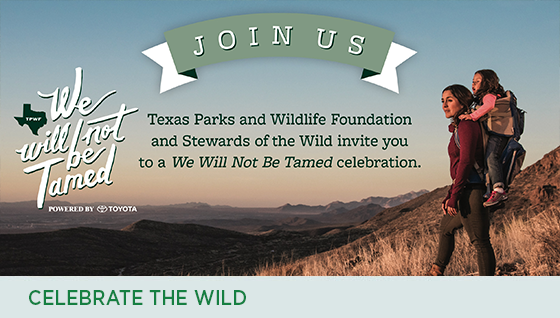 TPWF is partnering with the Stewards of the Wild to celebrate the wild things and wild places of Texas with a dinner and celebration to announce the winners of the We Will Not Be Tamed sweepstakes. Live music will be featured with Asleep at the Wheel and dinner will be provided by Pecan Lodge. We invite you to purchase tickets/tables for the dinner and celebration at the Longhorn Ballroom in Dallas on November 8.